Managing your documents digitally is great, we’re obviously fans . . .
Now, you can connect and send files for printing to over 170 global locations directly from SKYSITE. Order from California and print and deliver in Ohio, or Beijing, or London. Our print locations are all over, and provide professional, wide and narrow format printing services for almost any kind of document. To get started, select a file like any other online shopping cart. Select a file, add to the print cart, and go. Deliver prints back to yourself, or enter a new address and easily find the closest print location. 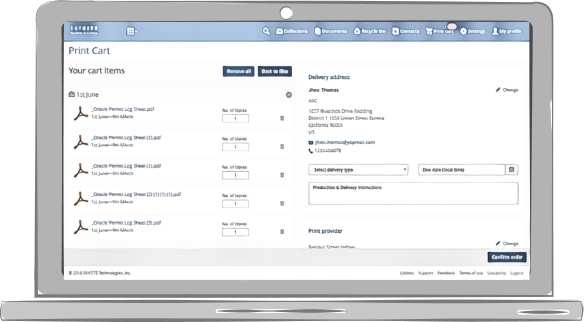 It’s easy and you can even select from multiple projects on the same print order. Digital or printed? No need to choose. Get SKYSITE today.